Some point over the years the tree skirt Matt and I had was ruined by water. I’ve been meaning to make a new one for us, but haven’t been really inspired. 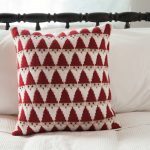 Then I saw the tutorial for Flannel Receiving Blankets on Purl Bee and fell in love with the simple crochet edging. I knew I wanted to use that look. 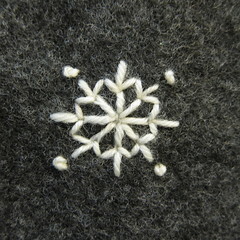 After I had done the edging my husband suggested the embroidered snowflakes for the interior. I was going to add a touch of red, but he wanted me to keep it grey and cream, a simple modern look. I really love the way it turned out. 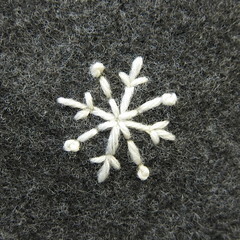 I still want to add a few more snowflakes, but wanted to show it to all of you before Christmas got too close. 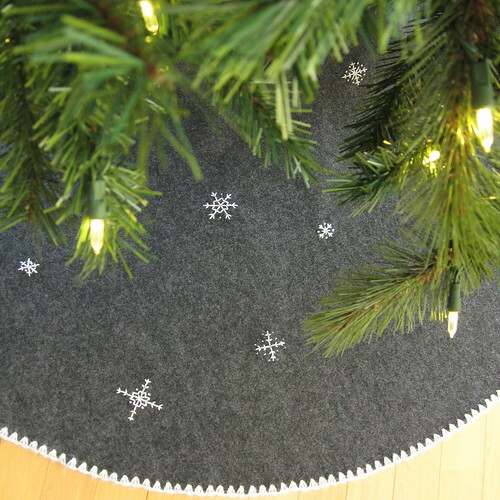 These directions are for a 48″ tree skirt, you can make the circle any size that fits your tree. fingerling, sport or sock weight yarn, I used Frog Tree Alpaca Sport for the edging an Serenity Sock Weight for the snowflakes. 1. Fold the fabric in half. 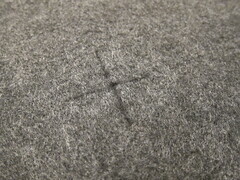 Mark the middle point along the fold. 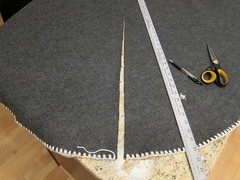 Tie the marker to the twine and then measure 24″ from the pen and attach the pin. Place the pin at the middle point and draw a half circle. This is easier to do with someone to hold the pin in place. 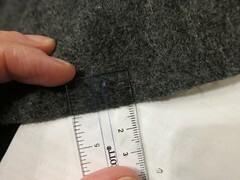 Cut along line you just marked through both layers of fabric. You have a 48″ x 48″ circle. Cut a straight line from the middle point of the circle to the edge. (I forgot to do this until my edging was done as you can see.) 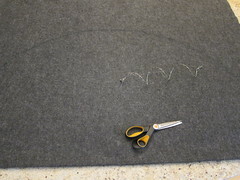 Cut a circle the size needed at the middle point for your tree trunk. My tree is fake and the middle pole is skinny enough that I don’t need to have a circle cut out for it. 2. 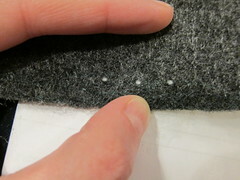 Make small holes along the edge of the circle about 1cm up and 1cm apart. I used the tip of my needle to make the holes. It just needs to be big enough for your crochet hook to get through. This may seem like extra work, but it will make the crocheting go a lot faster. 3. Starting at the opening in the circle, work 2 single crochets into a hole and then a chain stitch. The trick is to make sure to keep your tension even and not pull too tightly. Work into each hole you made in step 2 until you reach the other side of the opening in the circle. 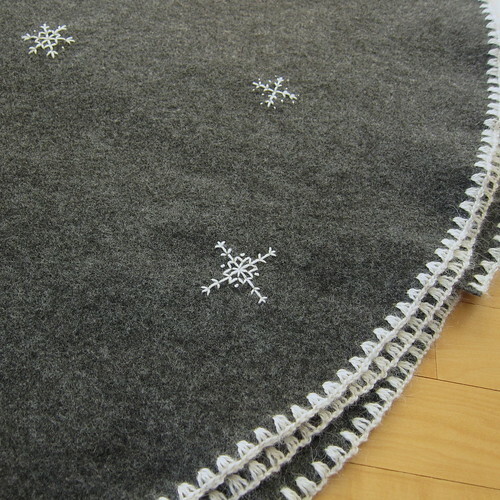 (See this tutorial on Purl Bee on how to do the edging.) You can also add edging to the opening and circle for the truck if you want, but since I figured no one would see that I didn’t. 4. 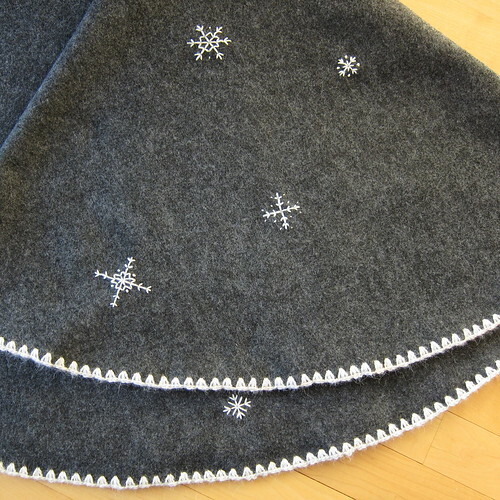 Embroider snowflakes around the body of the skirt. 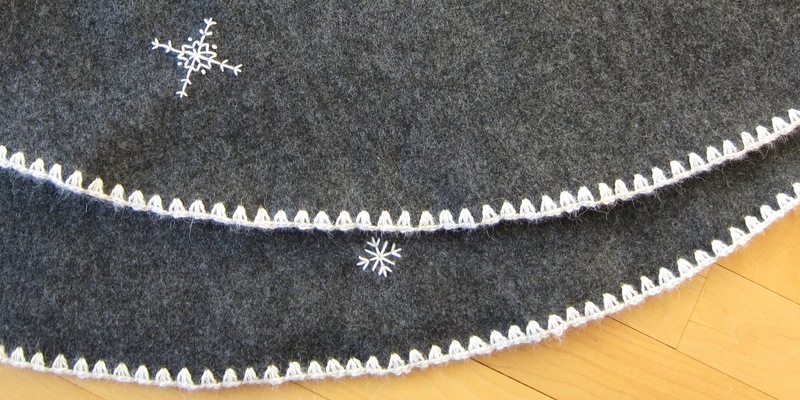 I found it helped to draw crosses on the back of the skirt to help keep the snowflakes somewhat straight. 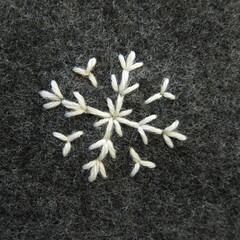 I embroidered my snowflakes with simple backstitches and french knots, making them up as I went along. Here are a few examples. 5. If you want the skirt to close, you can add velcro at the opening for the back. Place under the tree and cover with presents. 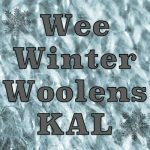 5 years ago by Kat in Christmas , Crochet , Crochet Projects , Embroidery , Embroidery Projects , Holiday , Needlecraft , Projects | You can follow any responses to this entry through the RSS feed. You can leave a response, or trackback from your own site. That’s very sweet. 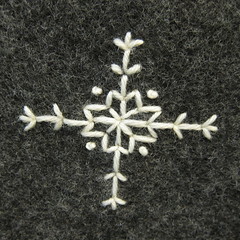 I love the snowflakes! Love the tree skirt! A tip for making your holes for the edging – there is a blade for rotary cutters exactly for that purpose, it’s called the Edge Perfect Blade. 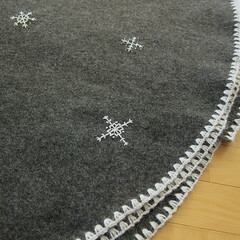 It saves a ton of time and I find it very handy for doing blanket stitch also. I am attempting this! Wish me luck. How big were your snowflakes?